He was born in Calcutta, West Bengal. 1921 As a student, illustrated several students magazines. 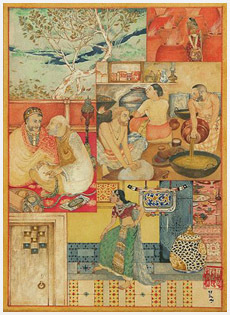 He was associated with Abanindranath Tagore and Gaganendranath Tagore for 28 years. Helped Abanindranath Tagore in stage designing, Calcutta. Had deep interest in carpentry and photography. 1952 Curator, Kala Bhavan Museum, Santiniketan. St. Agnes School, where his European teacher taught him to communicate colour with human mind. 1921 Joined Brahmacharya Ashram, Santiniketan (Under Rabindranath Tagore). Art training started at the famous Tagore residence, Jorasanko, Calcutta, under Gaganendranath Tagore and Abanindranath Tagore. 1949-50 Exhb. in Calcutta. 1951-52 Exhb. in New Delhi. 1955 Exhb. in Bombay. 1956 Exhb. in Gwalior. 1958 Exhb. in Lucknow. 1971 Exhb. in Calcutta. 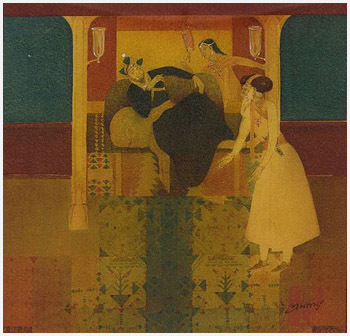 1998 `An Exhibition of Paintings by Prosanto Roy, A Retrospective`, Birla Academy of Art and Culture, Calcutta. 2003 Manifestations, organised by Delhi Art Gallery, World Trade Center, Mumbai and Delhi Art Gallery, New Delhi. 2004 Manifestations II, organised by Delhi Art Gallery, Jehangir Art Gallery, Mumbai and Delhi Art Gallery, New Delhi. 2005 Manifestations III, organised by Delhi Art Gallery, Nehru Center, Mumbai and Lalit Kala Akademi, New Delhi. Birla Academy of Art and Culture, Calcutta. Jane and Kito de Boer, Dubai. Neville Tuli, Bombay. Rabindra Bhavan, Lalit Kala Academy, New Delhi. Delhi Art Gallery, New Delhi. Prosanto Roy was one of the gifted artists who mastered the watercolour wash technique. He sought structural variety in his figuration and also sought variety in themes. Far-Eastern influence is very clear in his works. 1952-73 Curator and taught at Kala Bhavan, Santiniketan till his death.